Live, buy and innovate locally − where the road back to Michigan begins. The first step? Anchoring young professionals to a city rich in fresh and creative energy. Consumers Energy President and CEO John Russell talks about innovation in downtown Jackson. Leslie Youngdahl, a Consumers Energy young professional, remembers graduating high school with the plan to move out of Michigan. Yet, through her out-of-state and country travels, Leslie found herself drawn back home to the heart of Jackson and becoming a downtown resident. Leslie also is one of 180 spirited members from the newly formed Jackson Young Professionals. Michigan Gov. Rick Snyder joined Consumers Energy and more than 18 other Jackson businesses and three colleges to set sail on the Anchor Initiative. “Jackson is rocking,” Snyder said, praising the effort to encourage people to live, work and innovate in downtown Jackson. 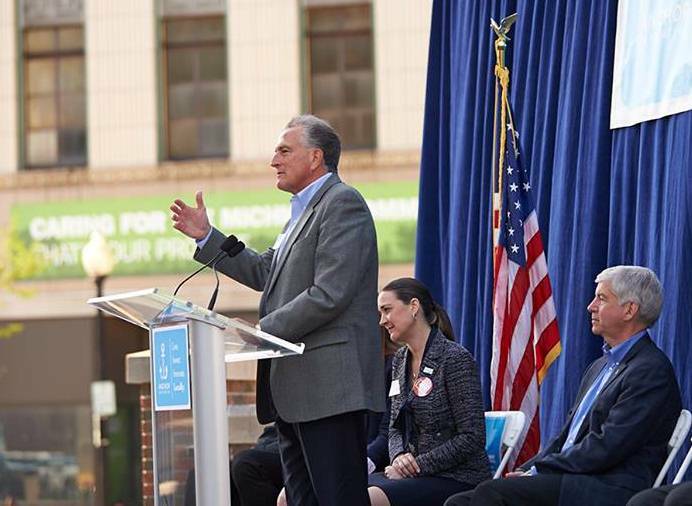 “Businesses like ours can enable Michigan’s downtowns to thrive, and we think what we are doing in Jackson can be a model across the state,” said Consumers Energy President and CEO, John Russell. Consumers Energy was founded in Jackson in 1886 and provides natural gas and electricity to 6.5 million of the state’s 10 million residents in all 68 Lower Peninsula counties. Live Locally: Present the idea of market rate rental units to developers and downtown business owners in order to house young professionals. Buy Locally: Encourage young professionals to support businesses in the community by investing in local goods and services. Innovate Locally: Provide creative spaces downtown to attract and stimulate innovation for economic expansion in the community. To learn more: Visit MLive, WILX TV-10 and WLNS TV-6.